WHITTIER — Police are investigating after three people showed up at Presbyterian Intercommunity Hospital with gunshot wounds, but refused to cooperate with investigators. The shooting victims arrived at the hospital, 12401 Washington Boulevard, in a bullet-riddled car, Whitter Police Lt. Randy Inman said. They were not cooperating with police, and it was unknown where the shooting took place, he said. The extent of the injuries was unclear. LOS ANGELES — A South El Monte man has agreed to plead guilty in connection to a scam that allegedly bilked about 200 distressed homeowners out of more than $2.5 million by falsely promising to eliminate their mortgage debt for a large fee, authorities announced Friday. Ernesto Diaz, 57, agreed to admit a single count of mail fraud for his role in a scam operated by his company, Crown Point Education, which has offices in Montebello and El Monte, California Department of Justice spokesman Thom Mrozek said in a written statement. Diaz solicited homeowners to pay fees of about $15,000 each to, promising he and his organization could force banks to forgive their mortgages, Mrozek said. He further promised clients their mortgages would be forgiven within six to eight months. “Instead of working on behalf of the homeowners, the man simply sent worthless ‘Sovereign Citizen’ paperwork to lenders — paperwork that did nothing to affect the mortgage of a single homeowner,” according to the statement. As part of his plea agreement, officials said, Diaz promised to cooperate in an investigation into Crown Point Education, Inc., which began operating in early 2009. While pitching the fraudulent scheme to clients, which he admitted in his plea agreement had never been successful, “Diaz failed to tell distressed homeowners that earlier Crown Point clients — including Diaz’s own brother — has lost their houses to foreclosure and been evicted from their houses,” Mrozek said. Additionally, authorities allege, Diaz and other Crown Point representatives filed bankruptcy documents on behalf of homeowners to delay foreclosure or eviction without their knowledge, often forging signatures in the process. Diaz was scheduled to appear in federal court Sept. 13. If convicted as charged, Diaz faces up to 20 years in federal prison. MONTEREY PARK — Dr Phil McGraw’s classic ’57 Chevy Bel Air has been stolen and detectives Friday sought the public’s help locating the vehicle. According to a press release issued Thursday the TV psychologist had his car breakdown on Sunday and ordered it towed to RODZ auto shop at 2800 N. San Fernando Road in Burbank. That night the shop was broken into and the car stolen, officials said. Investigators with the El Monte-based Taskforce for Regional Autotheft Prevention are working with Burbank officers in the investigation, according to Thursday’s press release. A $1,000 reward is being offered by RODZ automobile shop for information leading to the arrest and conviction of the suspect in this investigation and the safe return of the vehicle. It is unknown if Dr. Phil is offering a similar reward. The car, a black and silver convertible with red leather seats, is unique. Anyone with information about the vehicle can call the sheriff’s department. 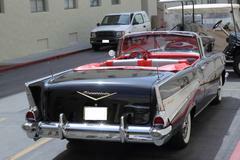 Is this the only ’57 Chevy ever stolen in LA? I doubt it. But somehow when its a celebrity’s car the cops think its OK to pour on the publicity. How much you want to bet that if its ever recovered Dr. Phil won’t be paying any impound fee. What joke. SOUTH WHITTIER – An elderly man died early Friday after being struck by a car on Telegraph Road, authorities said. The man, who appeared to be in his early- to mid-80s, was struck about 5:30 a.m. in the eastbound lanes of Telegraph Road, between Victoria and Mills avenue, in the unincorporated county area of South Whittier, California Highway Patrol officials said. His name was not available pending positive identification and notification of his family. Rescuers took the man to an Orange County hospital where he was pronounced dead a short time later, CHP Sgt. Tom Pontes said. He was crossing mid-block, without a crosswalk, when he was struck by a a 2008 Ford Focus being driven by a 39-year-old Whittier woman, who was unhurt, Pontes said. Sunrise did not occur until about 6:30 a.m., so it was still dark out when the man was struck, he added. Nothing criminal was initially suspected, however the investigation remained in it’s early stages, the sergeant said. Officials issued a Sig Alert for the eastbound lanes of Telegraph Road for about an hour as they investigated the scene, CHP Officer Ed Jacobs said. The investigation was being carried out by officers from the Santa Fe Springs office of the CHP, and any witnesses were asked to contact them at 562-868-0503. COVINA — A suspect was behind bars Friday in connection with the fatal stabbing of a 38-year-old Covina man in his own backyard. Gonzalo Robles died at the scene of the stabbing, which took place just before 1:50 p.m. Thursday in the 3600 block of Shadyglen Drive, in an unincorporated county area near Covina, Los Angeles County Department of Coroner Assistant Chief of Operations Ed Winter said. Louis Alberto Villaneda, 32, was booked early Friday on suspicion of murder after being treated at a hospital for stab wounds of his own, according to sheriff’s officials and county booking records. He was detained hours after the stabbing, authorities said, though information on how he came to be in custody was not available. Deputies who responded to the stabbing found Robles lying facedown in his backyard, according to sheriff’s officials. He had suffered multiple stab wounds, Winter said, and paramedics pronounced him dead at the scene. According to witnesses, the victim argued with another man and it escalated into a fight, Deputy Kim Manatt of the Sheriff’s Headquarter’s Bureau said in a written statement. Deputies closed off surrounding streets and searched the area. Covina Police Sgt. Ray Marquez said two schools, Royal Oak Middle School and Sierra Vista Middle School, were placed on lockdown for about an hour as deputies conducted a search for suspects. Villaneda was arrested on suspicion of murder just after midnight, records show. He was being held in lieu of $1 million bail at the sheriff’s San Dimas Station pending a scheduled arraignment Wednesday in West Covina Superior Court. A fight turned deadly when a 38-year-old resident was fatally stabbed by another man Thursday. A possible suspect was later detained. He was taken to a hospital because he has a stab wound. The unidentified man hasn’t been interviewed by detectives, according to sheriff’s department spokeswoman Deputy Kim Manatt. The fatal encounter happened at 1:48 p.m. in the 3600 block of Shadyglen Drive which is in the unincorporated county area near Covina. Deputies who responded to the stabbing found the victim lying facedown in his backyard. According to witnesses, Manatt said the victim argued with the suspect and it escalated into a fight. The victim was allegedly stabbed several times. Covina Police Sgt. Ray Marquez said two schools, Royal Oak Middle School at 303 S. Glendora Ave. and Sierra Vista at 777 E. Puente Ave., were placed on lockdown for about an hour. Deputies didn’t say if the suspect was found later or if he turned himself in. OUTH EL MONTE — A group of men on Thursday attacked and robbed the owner of a food truck then took his cash box which contained about $4 in pennies. Sgt. Mark Skaggs of the sheriff’s Temple Station doubted if the suspects knew how much was in the box. “Apparently (the victim) kept pennies there,” Skaggs said. The robbery was reported at 10:07 p.m. in the 2300 block of Continental Avenue. Skaggs said four to six men tried to pull the victim out of the truck. He was knocked down inside the vehicle. Some of the robbers then punched and hit him, Skaggs said. One suspect took the cash box from the truck. The robbers, described only as Latinos, fled in a silver 4-door Jeep. WEST COVINA — Police are planning a sobriety and driver’s license checkpoint Friday. The checkpoint will be held from 6 p.m. Friday to 2 a.m. Saturday at an undisclosed location within the city, West Covina police officials said in a written statement. “Checkpoints are planned in locations that have the greatest opportunity for achieving drunk and drugged driving deterrence and provide the greatest safety for officers and the public,” according to the statement. WHITTIER — A Pico Rivera man pleaded not guilty Thursday to charges of attempted murder, elder abuse and assault with a deadly weapon in connection with the stabbing of his 76-year-old grandmother earlier this month. Joseph David Torres, 22, entered his plea in Whittier Superior Court, where he was ordered to return Sept. 23 for a preliminary hearing setting, Los Angeles County District Attorney’s officials said. He’s accused of stabbing and severely wounding his grandmother Aug. 8 during an argument at the home they shared in the 5500 block of Bridgeview Avenue in Pico Rivera. The woman had told Torres he needed psychiatric help when he became enraged and attacked her, investigators said. His grandfather called 9-1-1 after discovering the woman wounded and Torres standing over her with a knife in-hand. According to county booking records, Torres was being held in lieu of $530,000 bail at the Twin Towers Correctional Facility in Los Angeles. HACIENDA HEIGHTS — A crash involving a half-dozen cars, including a Los Angeles police car, sent four people to the hospital and prompted the closure of several lanes of the westbound 60 just east of Hacienda Boulevard early Thursday. The crash took place just after 9:30 a.m., according to California Highway Patrol logs. In addition to the carpool and two left lanes, the westbound 60 Freeway offramp to Hacienda Boulevard was also shut down for more than an hour after the collision. The cause of the crash remained under investigation, however involved were an unmarked LAPD Ford Crown Victoria, a flatbed tow truck, a Chrysler PT Cruiser, a Chevrolet Silverado pickup truck, a Toyota Sienna minivan and a Toyota Solara sedan, CHP officer Eduardo Martinez said. The PT Cruiser was wedged beneath the tow truck, he said. A woman inside of it was taken to a trauma center as a precaution, however her injuries did not appear severe, the officer said. Two men and a woman who were inside the Silverado were also hospitalized with apparently minor injuries, Martinez said. No other injuries were reported. Two other minor two-car crashes occurred in the same area as a result of the aftermath of the first crash, but neither involved injuries, officials said. One of the drivers involved in one of the secondary crashes fled the scene of the minor collision.